Tomorrow marks one of my most anticipated events of the school year. The Local Science Fair will be upon us. Our students get to showcase their work to the community. If you have never attended one of these events, you don’t know what you are missing. I highly encourage your presence. I guarantee that you will not be disappointed. 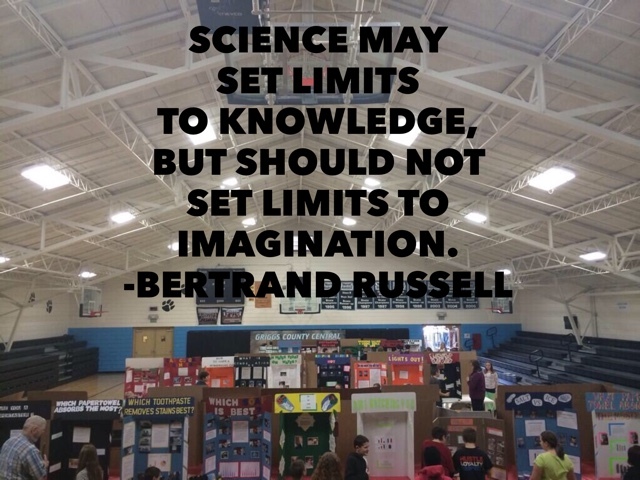 The Science Fair (I’m capitalizing because I believe it’s that important, but I’m really not sure if it should be capitalized) is Project Based Learning at it’s best. Our students identify a problem then use critical thinking skills to identify a hypothesis. They then communicate, collaborate, experiment, and record results. The projects are relevant because the students choose them. The projects are engaging because the kids put in a vested interest. The students are actively engaged in learning and they are in complete control. The creative mind sparks imagination. Imagination turns to practice and this practice leads to new learning. Now how can you not be excited about that? I must pause for a moment to share my excitement with a quote that completely outlines my passion for SCIENCE PROJECTS (Sorry….all caps now :). Tomorrow, I will walk through our local gymnasium full of excitement and hope. I will be excited to see our wonderful students doing extraordinary things. I will be hopeful for our future, as I will be reminded that our world will be in great hands when I grow old. I guess one could argue that I’ve already grown old, but since my own kids have not reached the age to do a SCIENCE PROJECT, I have to consider myself a baby still. But speaking of parents and SCIENCE PRJOCETS. You have grown to love the process or you have grown to dislike the process. I hope you choose the first one, and I hope you have turned the project over to your child. This is one of the greatest opportunities your child will get to be actively engaged in learning. This is where trial and error leads to knowledge. It’s where imagination becomes reality. Your child gets to showcase his/her work to the community and be darn proud of it. I’m so excited for tomorrow that I’m going to bed with my shirt and tie on. I feel like I’m the little football player in the movie “Little Giants.” I’m going to bed with my cleats on and I’m ready to get pumped up. Are you ready? Will you be there?